I came across this article on the “This Old House” web site. I thought it interesting because it brings to our attention two apparently good reasons why a person would choose a faux carriage garage door over an authentic, swing out, carriage garage door. After reading it though the question hung in my mind, is this really still the case today? As this article suggests, is the faux carriage door the better choice? Let's examine the evidence. “True carriage doors, the kind that actually swing open on hinges, are expensive, custom-made items that few people consider practical these days. But you can still get that old-world look with the convenience of a modern overhead door by upgrading to a carriage-look door... Each door has four foam-filled steel sections that slide up and down on tracks. ... To complete the look, we added black steel handles and faux strap hinges. 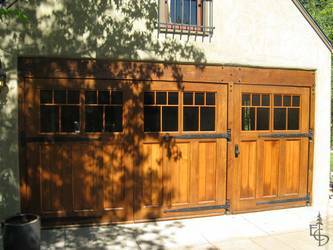 The article quoted above presents two main arguments against installing authentic, swing out carriage garage doors. First, expense and second, practicality. 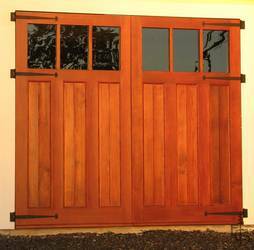 First: Authentic carriage garage doors are more expensive. This statement is true, but why? Quite simply, you get what you pay for. Authentic carriage doors are custom made with quality, not quantity being the main focus. They are a custom piece of wood work that will last decades. Whereas roll up doors are cheaply made in heavily automated factories, easily dented, and their mechanisms often break which inhibits their ability to function properly. All of these factors will without a doubt damage the home's curb appeal and overall value. I can't tell you how many houses I have looked at only to be put off by the mangled roll-up door which, incidentally, takes up a good portion of the exterior look of your home. Second: Authentic carriage garage doors are not practical. This is incorrect. With so many people transforming their garages into extra living space (e.g. studios, offices, rec areas) roll up doors are no longer considered convenient. They are ugly and the mechanisms often get in the way of utilizing all of the space available. Authentic, modern carriage doors will allow you all of the space you need and are as weather proof as your front door. They also offer the convenience of electronic openers. True, they may not work for every circumstance (such as a steep, sloping driveway) but you have the choice of either a swing out or sliding door, and they can be built to suit each individual's desires and situation. To fairly assess the differences we need to take into consideration that since this article was written, times have changed. The downfall of the economy brought changes in priorities and expectations of both home buyers and sellers. 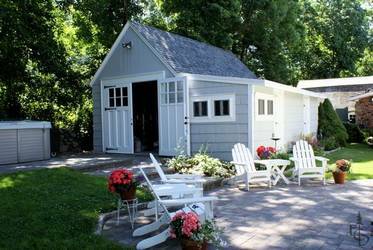 These days the garage often does not simply represent a place used for storing cars, toys, etc. It has become an extension of the home, offering the extra square footage that buyers are looking for and thus making the home far more valuable in today's market.